Baseball’s non-waiver trade deadline is now just one day away, yet in these waning moments … almost nothing big has happened. Following a flurry of early and interesting moves that included the A’s Jeff Samardzija blockbuster and several Angels bullpen deals, the market has grown suspiciously quiet, with rumors far outnumbering actual swaps. If history is any guide, however, we should see plenty of action between now and Thursday’s 4 p.m. ET deadline. Over the years, stars like Randy Johnson, Mark Teixeira, Manny Ramirez, and Mark McGwire have moved on deadline day, and while the odds of any players of that caliber moving this year are low, enough teams remain either in the playoff mix or in sell-now mode to ensure some last-minute love connections. With that in mind, here’s a look at some of the teams and players who seem most likely to play a role over the next 24-plus hours; some potential deals that would make a lot of sense; and some rumored swaps that wouldn’t, no matter what Twitter says. With the Rays surging and looking increasingly less likely to deal ace David Price, the Red Sox might be holding the deadline’s top available pitcher in Jon Lester. Reports indicate that the Sox have accepted their also-ran status this year and decided to aggressively shop Lester and top lefty reliever Andrew Miller, and maybe also lefty-mashing outfielder Jonny Gomes, right-handed starter John Lackey, utilityman Mike Carp, and others. Following Boston’s Tuesday-evening decision to scratch Lester from his scheduled Wednesday start, dealing the lefty seems all but guaranteed. Yahoo’s Jeff Passan and Tim Brown have identified the Pirates as a dark horse to land Lester, with top outfield prospect Josh Bell potentially on the table as a chip. I’ve harped on the Pirates’ need for starting pitching help all season, but considering their ability to make unparalleled defensive adjustments and wring strong showings out of seemingly miserable pitchers, I’m starting to wonder if the Buccos might be sorcerers. Just look at Vance Worley, who tossed the first shutout of his career Monday against the Giants, lowering his season ERA to 2.54 (and missing a #Maddux by one pitch); sure, the Giants’ lineup is a horror show right now, but still: We’re talking about VANCE WORLEY. That said, Pirates GM Neal Huntington has proven he’s willing to be aggressive before the July and August trade deadlines, acquiring players like Ryan Ludwick, Derrek Lee, Marlon Byrd, and Justin Morneau over the past few years. Lester would cost a lot more than any of those players did, but he’d also likely provide a lot more value, giving a team that just ended its 21-year playoff drought a legitimate ace to deploy down the stretch and possibly into October. With young staff ace Gerrit Cole due back from injury next week, the Pirates could score a gigantic rotation upgrade by simultaneously pulling off a deal for Lester. Hopefully Vanimal fans would understand. The Blue Jays are suddenly one of baseball’s hottest teams, having won nine of 12 since the All-Star break to surge into the American League’s second wild-card spot. On Monday, they made a small but important trade that should help them continue their push toward their first playoff berth in 21 years, sending 25-year-old right-hander Liam Hendriks and veteran catcher Erik Kratz from Triple-A to Kansas City for infielder Danny Valencia. The 29-year-old Valencia’s overall numbers don’t jump out, as he boasts a .279/.325/.378 line on the season and a .265/.304/.409 line for his career, with four career steals and mediocre defense. He’s been a beast against left-handers, though, batting .332/.369/.509 in 499 career plate appearances against them, and should form a potent third-base platoon with Juan Francisco, who’s slugging .585 against righties this year. If Brett Lawrie, Adam Lind, and Edwin Encarnacion also return from injury for the stretch run as hoped, Toronto will boast one of the league’s most potent lineups. The Jays remain in the market for pitching help, however, and that’s where things get tricky. Lester and Price, two of the top pitchers rumored to be on the market, both play for Toronto’s AL East rivals, and though the second wild card has altered the competitive landscape, it’s still rare to see division rivals strike blockbuster deals. That wrinkle aside, the Jays need to find a way to add an arm. Drew Hutchison has posted a 6.21 ERA over his last seven starts, Marcus Stroman has pitched beautifully but could be running into an innings cap, and J.A. Happ remains a placeholder and little more. Even if the Jays have to settle for a mid-rotation starter instead of an ace, they need to try for something. While Lester is inarguably the bigger prize, his teammate Lackey is the bigger bargain and one of the most attractive options for pitching-needy teams. 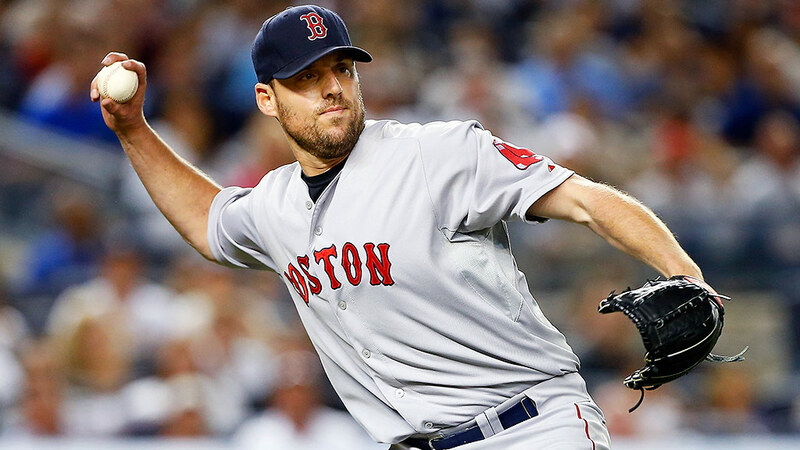 Lackey has been one of Boston’s few consistently good players this year, posting a 3.60 ERA and a strikeout-to-walk rate better than 3.5-to-1 while ranking among the league leaders in innings pitched. He also has an unusual and extremely favorable clause in his contract that stipulates that he remain under team control for the league-minimum salary in 2015 if he’s missed any significant time from 2010 through 2014 due to a preexisting elbow injury. Well, Lackey had Tommy John surgery in 2011, meaning he offers potential buyers a solid no. 2 or no. 3 starter for the rest of this year, plus the potential for 200 quality innings at a rookie rate next year. The Royals are reportedly interested, which makes perfect sense given their perennially low payroll and their likely need to replace impending free agent James Shields in next year’s rotation. The Royals would also like to upgrade an offense that’s the third-worst in the AL on a league- and park-adjusted basis, though that’ll be more difficult than addressing their pitching concerns. As I’ve noted before, much of K.C.’s offensive malaise stems from Eric Hosmer, Billy Butler, and Mike Moustakas severely underperforming expectations, but all three are beginning to improve, and all three remain core players who the team is unlikely to replace. Right field is the most logical place for an upgrade, with Norichika Aoki past his prime and in his walk year, but with potential target Marlon Byrd demanding to have his 2016 option picked up if he waives his no-trade clause and the rest of the market looking thin, that might not be easy, either. One logical alternative: Cubs outfielder Justin Ruggiano, who just shook off a minor groin injury and is hitting .300/.357/.457 since coming off the disabled list in late May. The Orioles will be an interesting team to watch today and tomorrow. Dan Duquette’s trading bona fides go all the way back to dealing for Pedro Martinez … twice, and last year the O’s GM made three deals at or a bit before the deadline to fortify the roster, nabbing right-handers Bud Norris, Scott Feldman, and Francisco Rodriguez. Acquiring real upgrades might be tougher this year because Baltimore is already pretty good to very good at virtually every position. Well, at every position other than starting pitching, where the O’s have been functional but rarely more than that. FanGraphs tracks a stat called ERA-, which calibrates league-average ERA to 100, then looks at pitcher performance based on how far a player deviates from that point; a pitcher with an 80 ERA- is 20 percent better than league average, while a pitcher with a 120 mark is 20 percent worse. Twenty-three-year-old phenom Kevin Gausman leads all Baltimore starters with a 92 ERA-, and after that there’s a whole lot of average, with Miguel Gonzalez at 95, Bud Norris and Wei-Yin Chen at 99, and Chris Tillman at 100. All but Gausman have posted worse-than-average results by fielding-independent numbers. With so many no. 4 starter types, the obvious move would be to chase an ace, but Duquette is reportedly refusing to part with Gausman or fellow highly touted pitching prospects like Dylan Bundy and Hunter Harvey. One alternative is acquiring a pitcher who’s not quite an ace but would fit with this roster’s makeup. Baltimore’s defense grades nicely in the infield, but much less so in the outfield (assuming defensive whiz David Lough isn’t out there), which makes Baltimore an attractive team for a ground ball pitcher like A.J. Burnett. O’s fans have been hearing rumors of the Maryland native coming to town since the Mesozoic era, but this pairing actually makes a lot of sense right now. Baltimore could presumably land Burnett without parting with an elite prospect, and he ranks among the most prolific worm-destroyers in the game. There are some complications — including Burnett getting shelled Monday night against the Mets, and a complicated 2015 option that could lead to him earning up to $12.75 million thanks to games-started incentives. Still, Burnett had pitched pretty well before Monday night, including tossing eight innings of shutout ball in his previous start, and the O’s do have money … if they’re willing to spend it. • The first-place Orioles’ other significant need is at catcher, with Matt Wieters out for the year following Tommy John surgery. Surprisingly, however, reports indicate that Baltimore is not pursuing the best option on the market, 2014 All-Star and walk-year Twins catcher Kurt Suzuki. The Cardinals seemed like another logical landing spot for Suzuki, but they just signed A.J. Pierzynski, who can’t hit, isn’t good defensively, and reportedly wasn’t well liked in Boston before the Sox cut him loose. If the Twins can’t find a good buyer for Suzuki, they might wind up playing out the string on his contract, which can sometimes happen even when it seems like a player would be a no-brainer match for another squad. • Though the Dodgers have been at the center of many trade rumors, GM Ned Colletti hasn’t really been a big July 31 shopper, with Drew Butera and recently acquired utility infielder Darwin Barney the team’s big non-waiver deadline adds the past couple of years. The Dodgers could get more aggressive in August, when teams toss all kinds of high-priced talent on waivers, often just to see if those players get claimed. That’s how the Gonzalez-Beckett-Crawford megadeal happened two years ago, and another big, albeit late, splash could happen this year. For instance, if the Phillies fail to find a partner for Cliff Lee before Thursday’s deadline, they could put him on waivers next month and tempt the Dodgers. Landing Lee would likely cost substantially less than landing Price (who may not even move), Lester (who will net a sizable haul), or Cole Hamels (who’s owed a pretty penny, and who might not be on the market anyway), thus creating a potential fit for a Philly-L.A. Lee deal. • Matt Kemp has started to hit better lately, including by mashing two homers Tuesday night, making his status as cloudy as ever. For much of this season, it seemed like Kemp was a dead weight for the Dodgers, but not one they’d easily be able to move because of his $114 million price tag. Kemp’s improved play could make him a more appealing target for outfield-needy teams, however … and less of an albatross for the Dodgers if they choose to keep him. • For teams with canyon-size holes, acquiring even decent talent can make a big difference. The Yankees knew that when they added Brandon McCarthy and Chase Headley, and New York should look for more of that kind of help. Ian Kennedy’s name has surfaced, and he’d be a strong upgrade for the Yanks’ rotation, but he’s also pitching better than ever before (even better than when he won 21 games in 2011) on a fielding-independent basis, striking out more than a batter an inning. If the Yankees or anyone else want Kennedy, they’ll have to pay up to whoever happens to be running the Padres’ baseball operations division this week. • OK, one tidbit on Price, even though trading him now would be tough for even the cold and calculating Rays. Per USA Today’s Bob Nightengale, St. Louis is prepared to offer this package for Price: top outfield prospect Oscar Taveras, young right-hander Shelby Miller, and a competitive balance pick the lowly Cards were able to acquire while the filthy-rich Rays were shut out. That’s … a lot. • We can talk about Troy Tulowitzki’s excellent taste in memes, but his weekend visit to Yankee Stadium really doesn’t mean anything more than a weekend visit to Yankee Stadium. The Rockies owners, the Monforts, are insanely image-conscious (even if they sometimes do a terrible job of managing that image) and don’t have any desire to trade away their franchise player, no matter how many Noah Syndergaards and Mookie Bettses you throw in. I can’t see the Rockies moving Tulo anytime soon. • Colorado’s apparent steadfast desire to keep Jorge de la Rosa and Brett Anderson unless some team offers half the farm is a lot more puzzling. Ditto for the Astros’ obsession with hanging on to reliever Chad Qualls. • Other potential sellers to watch: the Diamondbacks (Martin Prado and pitchers); the Cubs (Ruggiano and relievers James Russell and Wesley Wright); the Rangers (Alex Rios and Elvis Andrus, if they can ditch the latter’s big contract); the Twins (Josh Willingham); the Indians (Justin Masterson and Asdrubal Cabrera, though the Tribe might look to buy elsewhere); and the White Sox (Dayan Viciedo). • Other potential buyers to watch: the Rays (a reliever); the A’s (second base); the Braves (a top starter); the Brewers (a big arm, if they’re willing to move top pitching prospect Jimmy Nelson); the Mariners (outfield); and the Giants (where to start?). Stay tuned. This should be a fun ride.